Energy Wholesale Market Review Week ending 18 April 2019. Day-ahead power reversed the previous week’s gains, down 3.3% to end the week at £44.3/MWh. 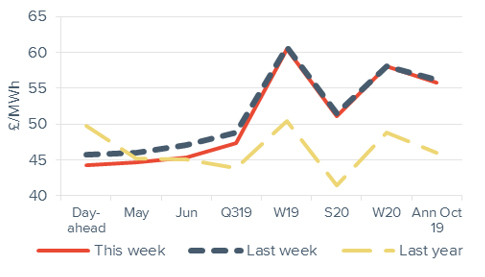 The month-ahead contract fell 3.1% to £44.6/MWh and June 19 power dropped 3.6% to £45.3/MWh. 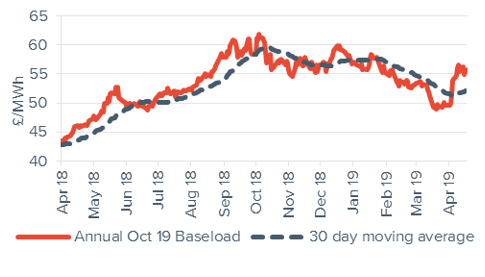 Annual October 19 power slipped 0.7% week-on-week to £55.7/MWh. The contract is 13.0% above the same time last month (£49.3/MWh).